Numerous activities can harm your teeth and create an acid imbalance in your mouth. When that happens, your teeth can lose nutrients and strength, and you could have trouble producing enough saliva containing the minerals your teeth need to stay strong and healthy. MI Paste is best used nightly in a custom fit tray. It can also be used by applying a small amount to your teeth, using a finger or cotton swab, and leaving undisturbed for 3 minutes. Once the time is up, you can spit out the paste, or swallow it, as it is completely safe to consume. 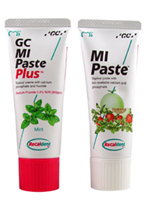 Repeated use over time will lead to decreased sensitivity, stronger enamel and a healthy oral environment. http://www.mi-paste.com/about.php or call Diamond Dental at 780-489-6700.